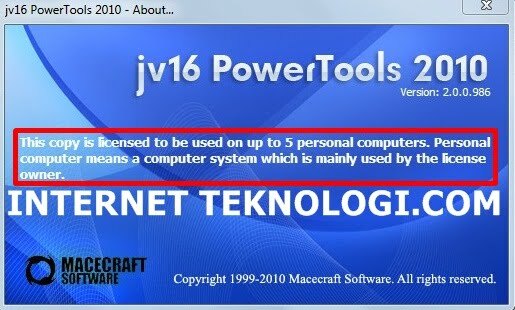 jv16 PowerTools merupakan The ultimate Windows optimization dan Tuneup Utility suite yang dapat menjaga komputer Anda berjalan mulus, cepat dan dapat meningkatkan stabilitas secara keseluruhan. 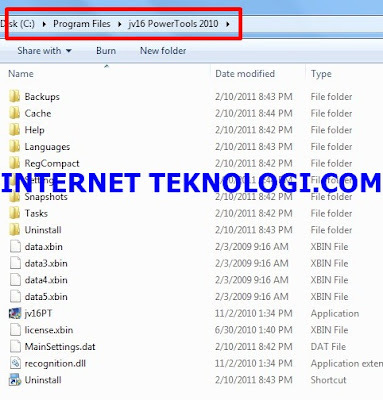 Karna jv16 PowerTools 2011 masih dalam Versi Beta,maka untuk saat ini jv16 PowerTools 2010 merupakan Versi yang Terbaik,Dengan 66 perbaikan dan Fitur Fitur baru, Cara terbaik untuk menjaga komputer Anda untuk dapat berjalan mulus, cepat dan lebih stabil dari sebelumnya. Supports: Windows 2000, Windows XP, Windows Vista, dan Windows 7. Sudah Termasuk windows Versi 64 Bit. 1. Usability improvement: Program now has two modes, Simple and Advanced. When in Simple mode, the more advanced features and options are not shown to the user. 2. New feature: Home screen feature added to the Main Window. 3. New tool: Clean and fix my computer, the tool scans the registry and the file system for errors and unneeded files, and also lists all the MRU and other history data and shows the results in one organized list. 5. New tool: Program Maintenance. 6. Improvement: The Quick System Analysis is now run only once, now called "Initial Setup". 7. Improvement: All the tools now use the same list component to list their results. 8. Improvement: All the result lists support Filter Panel feature, simply activate the list by clicking it and start to type to enable the Filter Panel. 9. Usability improvement: The tool tips of the Main Window are now better and shown using a better looking tool tip popup. 10. New feature: Tool icons in the Main Window have new click effects. 11. New feature: Tool windows are closed using a fade out effect. 12. Usability improvement: Right-Click menus now show a check box icon for features that work only with selected items, not with the currently highlighted item. 13. Usability improvement: All the tools now have an uniform set of basic features in the Right-Click menu, such as removing items from the list (without making any changes to your system). 14. Usability improvement: Backups and Settings are found in both the File menu and the Tools of the Main Window. 15. Usability improvement: All the tools now use a better main menu component. 16. Usability improvement: The Tools menu of the Main Window shows the available tools in categories, not as one long list. 17. Added feature: All the tools support grouping of the results, all the main tools allows the user to decide the grouping criteria. 18. Added feature: All tool result lists show the number of selected items on the group caption bar. 19. Improvement: Preference Saving is available on more tools than before. 21. Improvement: New icons for the Preference Saving feature. 22. Improvement: The Preference Saving feature's list and Delete icons are not visible to confuse the user before the Preference Saving has been used. 23. Usability improvement: All the main tools now support aborting the tool while its running. 24. Usability improvement: Aborting a tool automatically closes its window, instead of showing the user a blank results list. 25. New feature: Tab icons with modified content show an "i" icon to let the user know, it's no longer necessary to go through every tab of a tool before starting it. 26. Usability improvement: All the main tools now show a details panel at the top of the tool window to allow the user to see all the details of the currently selected line. 27. Improvement: Error and info messages are now integrated to the program windows, not as separate windows. 28. Improvement: All the main tools now show a special screen while working for an improved user experience. 29. Change: The tools no longer show "Threads running" field, it was found to be confusing by many users. 30. Improvement: Registry Finder made faster. 31. Improvement: More options added to the right click menu of all the main tools. 32. New feature: Registry Cleaner and Clean and fix my computer features support Additional Safety feature. 33. New feature: All the main tips and warnings are inside the tool window, and can be closed. 34. New feature: Registry Cleaner: selected setting explains with more details what kind of a scan will be performed. 35. Improvement: Registry Cleaner made faster. 36. 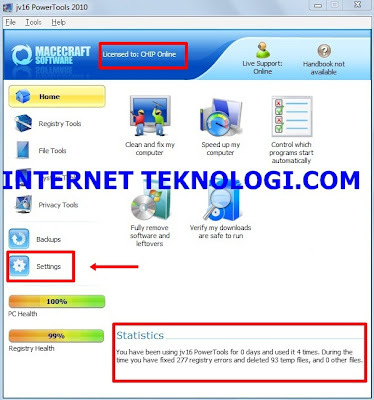 Improvement: Registry Cleaner's Scan Report is more clear and more user friendly. 37. New feature: It's now possible to get the Registry Cleaner's Scan Report to be shown again if "Don't show this window again" has been used. 38. 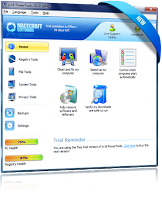 Improvement: Registry Cleaner contains a brand new registry cleaner engine with more built-in safety features and better overall accuracy. 39. Improvement: All the main tools automatically create a backup without confirmation from the user when the program is run in Simple mode (can be disabled). 40. Improvement: Registry Compactor is now available with Windows 7. 41. New feature: Registry Compactor supports two phased registry compaction where the first phase is run before Windows starts and the second phase (if needed) right after Windows startup. 42. New feature: Registry Information tool shows detailed information of the 32 and 64 bit registry views if run in 64 bit Windows. 43. Usability improvement: User interface of the Registry Information tool has been improved. 44. Improvement: Progress bar in Registry Monitor has been changed into creating the snapshot window with keys and values analyzed are running, also an option to Abort has been added. 45. Improvement: Registry Monitor: creating a snapshot has been made much faster. 46. Hidden feature: File Finder: Search by attributes available for advanced users. 47. Hidden feature: File Finder: Search by contents available for advanced users. 48. Hidden feature: File Finder: search by owner available for advanced users. 49. Improvement: File Finder: search by date improved. 50. Improvement: File Finder search: scanning window has the threads running, files and dirs analyzed. 51. Changed: Remove from list removed from more functions... It has been moved into right click menu > list control. 52. Usability improvement: File Cleaner has been made more user friendly. 53. New feature: File Cleaner support Additional Safety feature. 54. Improvement: File Recovery search made faster. 55. 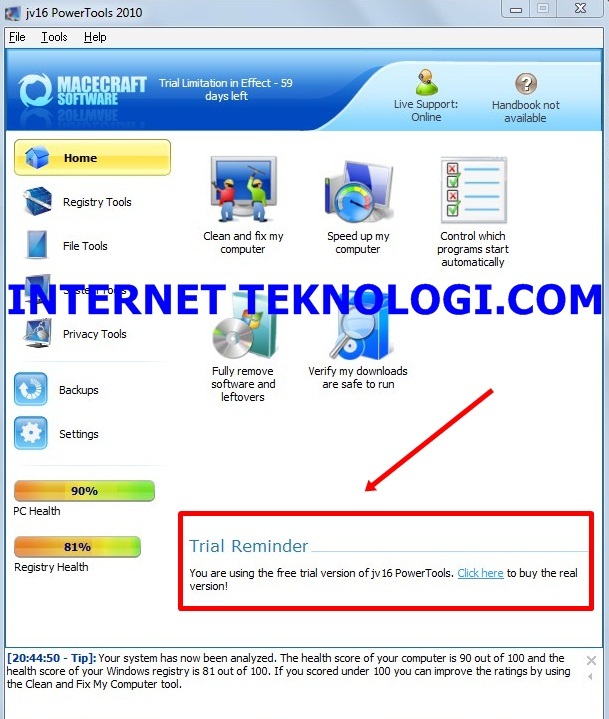 Added feature: Installation path and main executable has been added to the Software Uninstaller's list, there is no need to click the item to see this information. 56. Changed: Startup Manager: disable and new buttons have changed places. 57. Changed: Service Manager outlook has been changed. Description can be found on the top. 58. 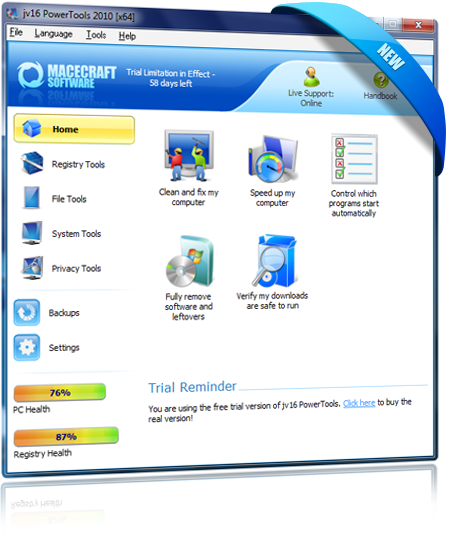 Improvement: System Optimizer is now fully compatible with Windows 7. 59. New feature: Global Ignore List allows the user to ignore data, such as disk drives or software names, in a way no feature of PowerTools touches it. 60. Usability improvement: Program Maintenance removed from settings and moved to the Tools menu of the Main Window. 61. New feature: There are many new maintenance features available in the Program Maintenance tool. 62. New feature: When started the first time, the program automatically creates a backup of the most critical parts of the registry. These backups can be restored from the Backup Tool. 63. New feature: General purpose text area added to the Main Window. It can show statistics of the program's usage, and it's possible to send data from Macecraft's servers to this text area, such as news. 64. New feature: Registry Cleaner, and all the other main tools, now confirms from user if a potentially dangerous item is being removed. 66. Improvement: jv16 PowerTools 2010 launches after the longest and most comprehensive beta testing and quality control program ever conducted by this company! Seketika membuat Windows berjalan lebih cepat dan lancar dengan menonaktifkan fitur-fitur tertentu yang tidak memiliki fungsi dan memodifikasi beberapa sistem. Secara otomatis membersihkan registri Windows Anda dari data usang dan tidak dibutuhkan. Secara otomatis memperbaiki berbagai macam kesalahan registri, seperti referensi file rusak. Dapat dengan Mudah menemukan jejak sisa uninstall Software yang Anda pikir sudah dihapus bertahun-tahun lalu. Mendeteksi dan menghapus data History yang tidak diperlukan dan MRU (yang terakhir digunakan) daftar yang dapat berisi informasi sensitif mengenai Anda / Informasi Pribadi anda. Scan dan hapus file yang tidak diperlukan, termasuk file temp dan file duplikat. 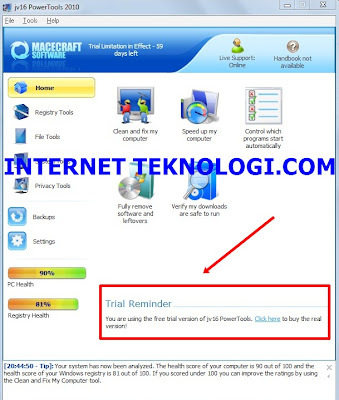 Disitusnya untuk mendapatkan yang Full Version anda harus membayar sebesar $29.95, Tapi seperti Biasa Di InternetTeknologi.Com anda akan mendapatkan secara Gratis. 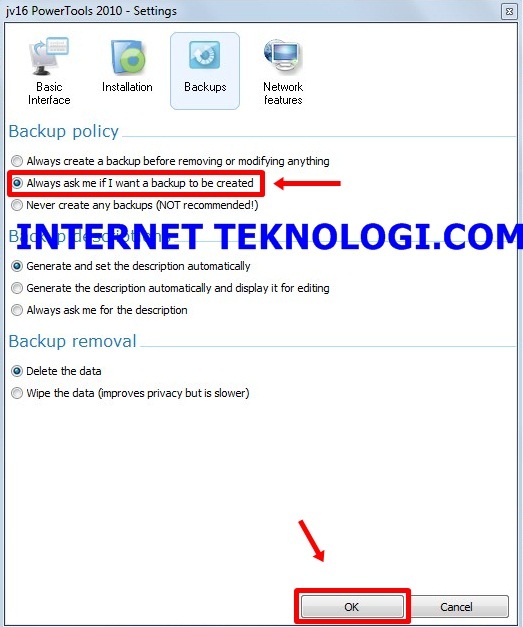 Extract,Install File bernama jv16pt_setup InternetTeknologi.Com sampai selesai. Ketika anda membersihkan atau memperbaiki maka software ini akan membuat Back up File secara otomatis tanpa pemberitahuan terlebih dulu. 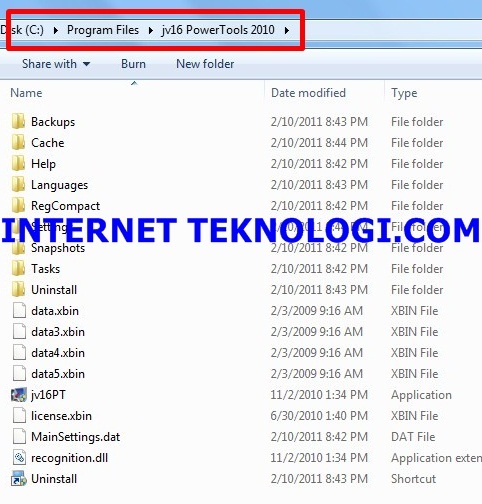 6 orang berkomentar on "Download jv16 PowerTools 2010 2.0.0.986 Final Full Version"
kk bagaimana cara mengaktivasi windows 7 ultimate? ?